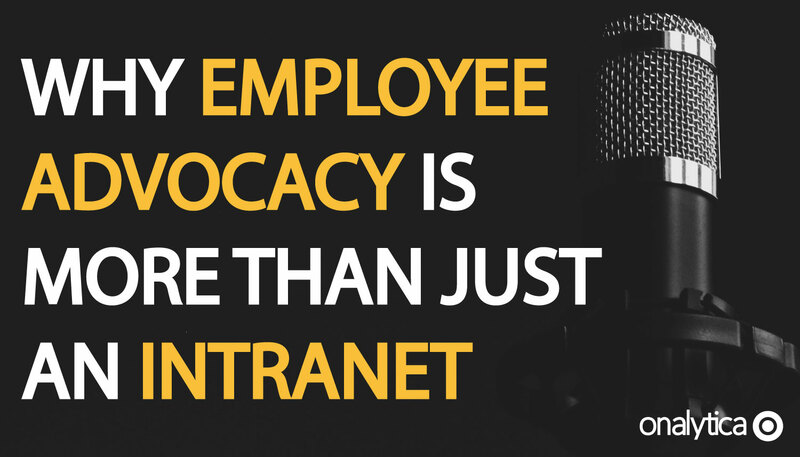 The phrase “employee advocacy” conjures a lot of thoughts in the minds of the marketers. It can raise the prospect of having to rely on colleagues to be the conduit for the messages you’ve spent hours carefully honing. It’s a scary thought, but luckily the tools are at hand to turn the people who sit all around you (even Alan from Sales) into assets that drive your key objectives, building from the foundation of a solid employee communications plan. If you create the right environment to share and develop your messages in collaboration with employees, rather than treating them as a broadcast channel to boost your reach, you can develop a tremendous asset to your business and make the most of the opportunity that employee advocacy represents. If you think about how to start up-skilling your colleagues, it starts with a solid plan to communicate. When the field of employee advocacy and communications started to grow, one-to-many solutions geared towards spreading major announcements seemed like the most sensible way to proceed. Providing everyone with a place to get the latest news and access resources like training materials obviously makes sense – the second there’s more than one of you in a business, information starts to get siloed! But the initial needs that intranet-type solutions satisfied are not fit for purpose when you’re trying to start a real conversation. To really grow employees’ confidence and skill-set, you need to engage them in a conversation, and one-way broadcasting solutions are never going to fit the bill. You need to establish forums where the PR team can share the latest industry news, the product team can discuss how the latest feature might help customers across your target industries, and the client-facing teams can relay how customers are using your products to achieve their goals. Think about the journey you’re trying to take your employees on. You want to give as many people as possible in the organisation the confidence to grow their influence and become smart, informative advocates for your brand across all their channels. As you move between the steps in this model from our excellent white paper (come back here to download it once you’re finished reading this), think about how you can help everyone focus more on the themes affecting your industry, and less on your brand. If you met someone at a party and all they did was talk about themselves, you might think they were a bit of a bore. Someone who shows curiosity about the world around them, the issues that affect their job & their industry, and engages with what others have to say – that sounds like the conversation most of us would rather be having! After all, to turn employees into influential voices speaking on your behalf, you’ll need to humanise them, and make them seem like someone worth talking to. 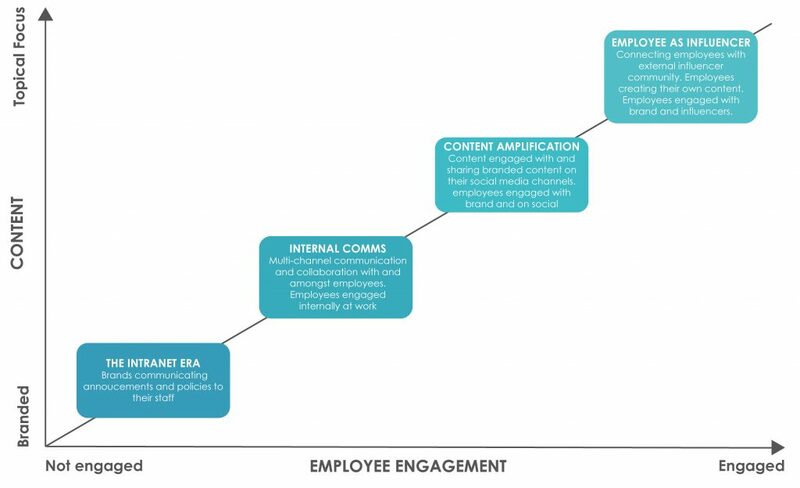 Luckily, the intranet and internal comms phases of this journey should have created the building blocks for this strategy. If you’ve fostered the right environment for internal comms, there should be a wealth of knowledge and discussion just waiting to be unleashed. Think back to the conversations happening internally – industry news, product releases and customer stories. If those themes sound familiar, it’s because they’re probably already pillars of your content strategy. You’ll be talking about what’s going on in your industry, telling client stories and explaining how your products & services can solve core business problems. This overlap between what you want to talk about, and what your colleagues are all talking about should be all the evidence you need that there’s a whole wealth of information to be mined from opening up a two-way conversation. For you to turn employees into the authentic voice of your brand, you’re going to have to let them bring their own messages to the table, not just their audiences. Most companies are all ready engaged in this sort of knowledge sharing on an informal basis – it’s in your workplace chat service archives or the water-cooler conversation about a recent client meeting. But there’s a huge amount to learn from mining these resources. Ask yourself, for example, where other people in the workplace are finding their thought leadership content – where do they go for interesting blogs on industry developments, who do they follow on Twitter or LinkedIn to get interesting perspectives? Given how daunting it can be to imagine constantly feeding an organisation with fresh content to share, this thought should come as a huge relief. You don’t have to do it all yourself! You do, however, have to create a place where all this content can come together. 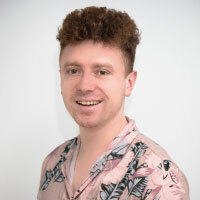 Too often, brands find that a set of tools they’ve bought for content sharing end up like the intranets that came before them, filled with information that was travelling in one direction with little discussion or debate. No wonder employees often feel disengaged from a process that simply rewards sharing in bulk, there’s no opportunity for them to genuinely contribute to a process the marketing and comms functions supposedly want them to participate in! Once you’ve created a space for people to share their insights, you can start building on the contributions you have. There’s lots that you can keep adding in to the mix to help employees feel confident in building their profiles and growing themselves into industry experts, not just mouthpieces for the brand. You can add to the industry content people are submitting with your suggestions for popular articles which are circulating each week. Suggest that rather than just sharing them, everyone takes the time to read them (best to keep them under 5 mins in length!) and add their own thoughts. If you know who the top influencers are in your industry, give people a suggested list to follow – these people are already curating huge amounts of relevant content in their social feeds & blogs, so let them do the hard work of finding content for you. Engaging with these influencers will help get employees involved in the key conversations happening around your industry. If your colleagues are going to spend any time lending their efforts to your campaigns and key messaging, it’s best that they spend it where the conversations are happening, so they can find and network with like-minded people (letting people know which hashtags are commonly used in their field is another way to help them connect with the right conversations). Most importantly, offer advice and encouragement. A lot of people will feel tentative sharing content – that’s understandable, as it might be quite far removed from their job. Leading with the benefits to each employee personally is a great place to start. Taking an industry-led approach which focuses on letting each employee create an authentic voice is a great way to grow their personal brand and influence. It’s a great way to help them learn more about the industry they work in and network with others who share their interests. In short, it should be an easy sell, as long as the benefits are clear to each individual. Are you suggesting places employees can find good thought leadership content? Have you asked them where they get theirs? Have you told them who the best influencers to follow in your space are? Are the benefits to each employee personally (growing their brand & influence) clear? Do you have guidelines or recommendations for how to post on social? Want to learn how you can take your influencer marketing and employee advocacy programs to the next level? Get in touch clicking the button below.